(There are 4 different written methods for TU x U, grid method and formal written methods. 4 different written methods for HTU x U – grid method and formal written methods. There are 8 tasks for each type of method so work can differentiated across the class depending on their ability and understanding of the different written methods. They could also be used into conjunction with manipulatives and resources. 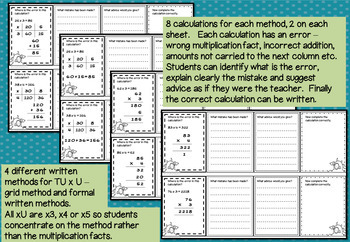 Each calculation has an error – wrong multiplication fact, incorrect addition, amounts not carried to the next column etc. 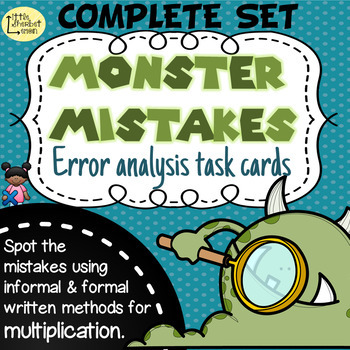 Students can identify what is the error, explain clearly the mistake and suggest advice as if they were the teacher. Finally the correct calculation can be written. The task cards have been made so that they are easy to photocopy and use. They could be enlarged for those who need more space for their writing. They could be used as an activity for individuals or students could work in a group of 4 and each complete the first box and then pass to the person on their left, complete the next section and pass again until all the sections are completed. This product is over 120 pages. Answers are fully included with details of where the error is on the calculation, what was the error, advice that could be given and the correct answers. 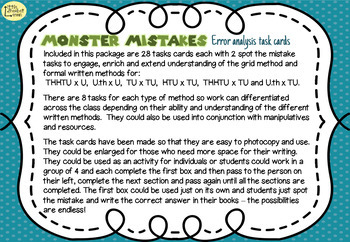 These can be used by teachers to mark work or given to the students to self mark their own work.